signed and dated 1933 and on verso signed in graphite on the canvas, titled and inscribed "1045 West 16th, Vancouver, BC"
W.P. Weston is one of the artists whose vision has defined our perception of British Columbia’s wild landscape. After emigrating from England in 1909 and taking a position as an art teacher in Vancouver, Weston, an avid hiker and sailor, set out to explore his natural surroundings. He soon perceived that he had to discard his previous training at the Putney School of Art in London, in order to capture in his work the raw power that he saw there. He immersed himself in painting and drawing, revealing that “I painted some pretty wild things, but always I came a little closer to my own language of form and the expression of my own feeling for this coast region; its epic quality, its grandeur, its natural beauty.” Having found his vision, Weston proceeded to paint some of our most iconic images of West Coast mountains and forests. Painting in relative isolation in BC, Weston claimed not to have actually seen the work of the Group of Seven until 1930, although it is unlikely he would have been unaware of what they were doing. Certainly in this work one can see the influence of Lawren Harris’s works such as The Old Stump, Lake Superior, 1926 and the National Gallery of Canada canvas North Shore, Lake Superior, 1926, acquired by the gallery in 1930, the same year that Weston said he first saw works by the Group. Harris was aware of Weston, having recommended the acquisition of Weston’s painting Cheam by Hart House at the University of Toronto in 1933. A more direct influence, although it is not immediately obvious in his work, came from Emily Carr, who he regularly visited in the 1930s, as he spent 22 summers in Victoria, teaching at the Summer School for Teachers. Although Weston’s style was more graphic, Ian Thom points out that, “her influence can be clearly seen in his canvases with dappled, high arching skies which act as unifying ‘brackets’ over the compositions.” Weston’s mature vision was characterized by clarity and precision, a kind of realism which brought out the uniqueness of the sites that he depicted and eliminated extraneous details to focus on the dominant elements, such as a magnificent mountain peak, a coastal view of ocean and mountains or a single, powerful tree. 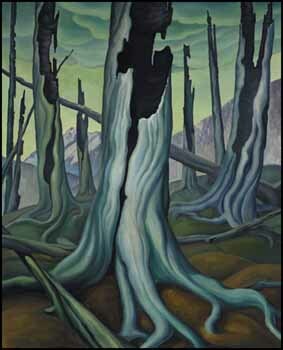 Trees were important subjects for Weston, and he captured their essence at various stages of their life cycles. He portrayed trees gnarled with age, towering Douglas firs in full maturity, sculpted driftwood or dead trees scorched by fire or lightning - all powerful in their various states. Desolation focuses on a group of trees swept over by fire, stripped down to the bones of their trunks and roots, on a forest floor of exposed earth. The central tree, still upright, and surrounded by the remains of other trees, stands like a sentinel against a background of mountains covered by the living forest. Weston focuses on the sculptural qualities of its form, with the molded creases of the trunk and strong roots still gripping the earth. The silver wood strongly contrasts to the black of the charred hollow core and the orange-brown of the exposed earth of the forest floor. What is communicated is not only an aesthetically stirring image, but the primeval force of nature and its will to survive, and that, no matter what happens, the forest will go on, evolving through the stages of birth, growth and death. Contributing to the power of the work is the pale green backlight of the sky and the molded clouds. Desolation is a magnificent work, not only visually striking, but full of the power of nature present in the British Columbia wilderness. During his lifetime, Weston was recognized through his involvement with art societies and their exhibitions such as the British Columbia Society of Fine Arts, of which he was elected president in 1931, the Royal Canadian Academy and the Canadian Group of Painters. He was given retrospectives at the Vancouver Art Gallery in 1946 and 1959. In contemporary times, his work has become ever more sought after, as recognition of his extraordinary iconic vision of the West Coast has spread, and masterworks such as this become ever more rare.